I shoved a spoon full of lemon rice in my mouth and immediately scrunch up my nose. Sherry follows and her displeasure is just as immediate. “Maybe we should consider doing that food tour in the next few days instead of later on.” I suggest. This is how we ended up on at a toddy bar in the Backwaters in the middle of nowhere and me laying down under the high noon sun drunk on coconut moonshine. A food tour of Kochi through Urban Adventures to get a better understanding of the distinctive Kerala cuisine and more importantly to uncover a few decent local places to eat as Fort Kochi will be our home base for the next two weeks. Raj, our guide is a fisherman turned tour guide turned entrepreneur who speaks impeccable English. Borne in a village in the Backwaters, Raj was a fisherman, setting out daily in his handmade wooden boat. Then through a series of only-in-a-storybook kind of perfect timing and guardian angles, he became a tour operator and now a semi-eccentric inventor. It didn’t take for Raj long to figure out we are not tourist but long-term travelers. The semi-grungy teashop at the side of the road only brought out our sense of delight. 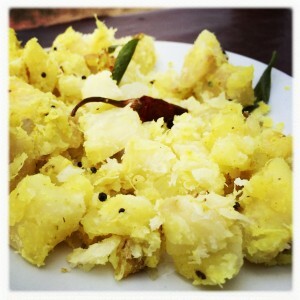 Neyappa, rice flour w/ jaggery, caradaman and deep fried. Instead of hand sanitizer, we pulled out our cameras, Instead of attempting to drink chai from the glass without putting our lips to the glass, we asked for more chai and more snacks. The toddy bar is three small shacks delicately balanced over a fish farm in the middle of nowhere. There is a sign on the side of the road in Hindi listing the 5-6 dishes they serve. The in descript shacks are set so far back from the main road, you would most likely pass the sign and wonder who left a sign on the side of the road. We sit under a coconut tree on the tiny stripes of land in-between each shrimp farms. There’ s coconut moonshine, fish in a spicy red sauce (we should’ve been taking notes but we got distracted by the moonshine), tapioca in coconut, sautéed clams and noodle paddies. Our cook is a shirtless man with kind eyes working in a metal shack doubling as a kitchen. The moonshine comes directly from the coconut tree and it is naturally fermented at 3-4% and it gets stronger the longer you let it sit. It’s slightly sour, not unlike the fermented horse milk we had in Mongolia except its less viscous in texture. Raj demonstrates by dipping a finger into his glass and shaking it on the ground. “Then you do this,” he picks up the glass and downs it in one go. I can’t very well drink my slowly now can I? We chat, eat, and temper the burning spice with more moonshine. All of sudden, I am sweaty, clammy and sitting up right takes too much effort. Deep in the Backwaters, in the lake but not too far from shore, Raj literally has a two tiny islands (each of them about 400 square feet) with a hut and some coconut trees. “Which one do you want to try?” He points to the jars of pickled fruits and berries on the man’s little cart. We get some gooseberries and green mangos. Then lime water with ice. This might be the penultimate in this day of food Russian roulette we’ve been playing. 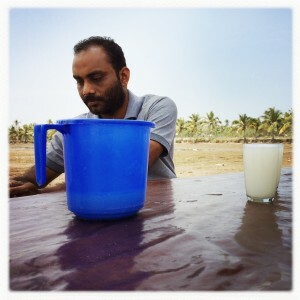 Up and down the Backwaters, we’ve eaten at places that is far from clean, drank from glasses that may or maynot be clean and now ice from the roadside cart. If our stomach holds out against all the foreign bacterias and unknows, we are gold! One Response to "A Day of Dubious Eating in 5 Parts"